Topics for questions: Canine fitness, massage, TTouch, general dog training, fear, and harnesses (including her own Balance harness). You have many talents - massage, fitness, TTouch, training,...what does a typical day with clients look like for you? What's your favorite part about working with dogs? A lot of behavior issues are related to pain. What are signs of pain or discomfort that we can look for as trainers? Yesterday I noticed that my dog Peanut was having trouble with his back paws. Two times he set his feet down upside down before righting it himself. Any tips on that? What are some other senior physical fitness tips? You teach fitness seminars for dogs [like the upcoming Shape Up seminar in Alaska]. What do you cover in there and why might people want to attend? My question is can /should I still have her sit or lay down on cue. You invented the Balance Harness and I know you're passionate about well-fitted harnesses. Can you share some harness fitting tips, in general and with the Balance Harness in particular? What brought you into your work with dogs? Can you talk about stress reduction? What are some ways you reduce stress in dogs that regular trainers might not know about? Any suggestions for new dog professionals starting a business? Lori designed the Balance Harness that Bean is wearing here! She uses humane, friendly, scientific and innovative methods, in an educational environment, to improve the health, behavior, and performance of animals. Lori’s experience and approach are holistic and one of respect for animals as teachers. She continually studies the interactions among animal behavior, movement, learning, and health. Her continuing education includes conferences (e.g. Clicker Expo) and seminars on behavior (e.g. Dr. Susan Friedman), positive training, canine fitness, and rehabilitation techniques. 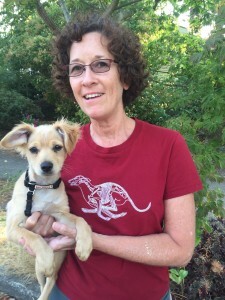 She has an established companion animal practice in Seattle which offers private sessions and webinars. She also teaches workshops worldwide, including an upcoming Canine Fitness seminar hosted by Grisha Alaska. Lori has three DVDs produced by Tawzer Dog Videos. She can be contacted via her website, SeattleTTouch.com.